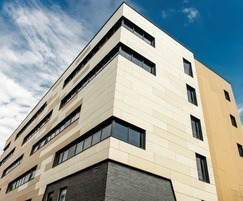 A newly built student accommodation block in Liverpool features an attractive, colourful external finish, thanks to Cembrit’s Cembonit cladding boards. Plato House is a purpose-built student development comprising 86 spacious student rooms complete with a kitchen, en-suite bathrooms and high speed Wi-Fi throughout. Built over 6 storeys, the accommodation is located within a short walking distance of Liverpool John Moores University, Liverpool Hope University and the University of Liverpool. 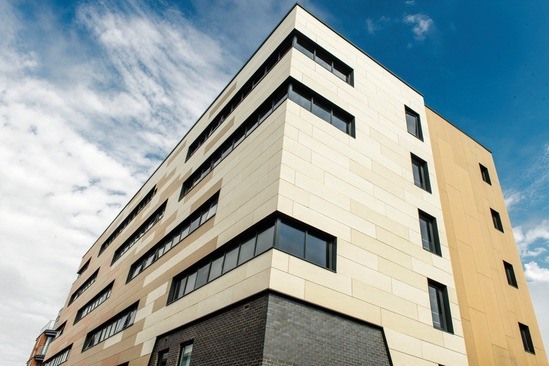 Supplied via Vivalda of Manchester, Pemberton-based cladding contractor, Bak Cladding Solutions installed approximately 1000m2 of Cembonit cladding in a combination of Tufa, Pearl and Sand colours. Cembonit is an autoclaved, through-coloured board in 11 pastel coloured impact-resistant boards characterised by an attractive matt finish and faint directional grain. Randomly dispersed spherules of cement in Cembonit’s surface and variations of shade from sheet to sheet will assist in creating a natural looking façade. During the production process, Cembonit undergoes a unique impregnation treatment, which effectively protects against water staining and dirt, ensuring that the façade retains its attractive appearance in both dry and wet weather conditions. The combination of colour stability, with a Class 0 fire rating to BS 476 Part 6 and a Class 1 rating to BS 476 Part 7, makes Cembonit ideal for over-cladding rainscreen applications. The sheets can be used for a range of applications, such as: rainscreen cladding, weatherboarding, window elements, fascia, balconies and prefabricated facade elements.